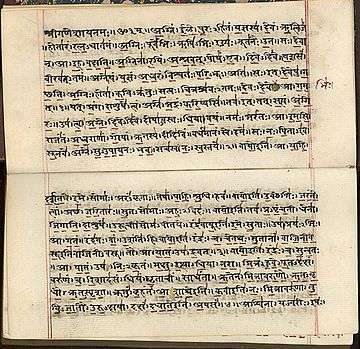 The Vedas (/ˈveɪdəz, ˈviː-/; Sanskrit: वेद véda, "knowledge") are a large body of texts originating in the ancient Indian subcontinent. Composed in Vedic Sanskrit, the texts constitute the oldest layer of Sanskrit literature and the oldest scriptures of Hinduism. Hindus consider the Vedas to be apauruṣeya, which means "not of a man, superhuman" and "impersonal, authorless". Vedas are also called śruti ("what is heard") literature, distinguishing them from other religious texts, which are called smṛti ("what is remembered"). The Veda, for orthodox Indian theologians, are considered revelations seen by ancient sages after intense meditation, and texts that have been more carefully preserved since ancient times. In the Hindu Epic the Mahabharata, the creation of Vedas is credited to Brahma. The Vedic hymns themselves assert that they were skillfully created by Rishis (sages), after inspired creativity, just as a carpenter builds a chariot. The various Indian philosophies and denominations have taken differing positions on the Vedas. Schools of Indian philosophy which cite the Vedas as their scriptural authority are classified as "orthodox" (āstika). [note 1] Other śramaṇa traditions, such as Lokayata, Carvaka, Ajivika, Buddhism and Jainism, which did not regard the Vedas as authorities, are referred to as "heterodox" or "non-orthodox" (nāstika) schools. Despite their differences, just like the texts of the śramaṇa traditions, the layers of texts in the Vedas discuss similar ideas and concepts. The Sanskrit word véda "knowledge, wisdom" is derived from the root vid- "to know". This is reconstructed as being derived from the Proto-Indo-European root *u̯eid-, meaning "see" or "know". The noun is from Proto-Indo-European *u̯eidos, cognate to Greek (ϝ)εἶδος "aspect", "form" . Not to be confused is the homonymous 1st and 3rd person singular perfect tense véda, cognate to Greek (ϝ)οἶδα (w)oida "I know". Root cognates are Greek ἰδέα, English wit, etc., Latin videō "I see", etc. The Sanskrit term veda as a common noun means "knowledge", but can also be used to refer to fields of study unrelated to liturgy or ritual, e.g. in agada-veda "medical science", sasya-veda "science of agriculture" or sarpa-veda "science of snakes" (already found in the early Upanishads); durveda means "with bad knowledge, ignorant". A related word Vedena appears in hymn 8.19.5 of the Rigveda. It was translated by Ralph T. H. Griffith as "ritual lore", as "studying the Veda" by the 14th century Indian scholar Sayana, as "bundle of grass" by Max Müller, and as "with the Veda" by H.H. Wilson. Vedas are called Maṛai or Vaymoli in parts of South India. Marai literally means "hidden, a secret, mystery". 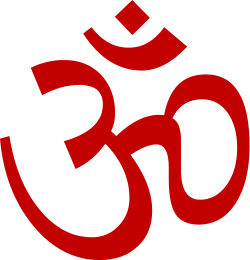 In some south Indian communities such as Iyengars, the word Veda includes the Tamil writings of the Alvar saints, such as Divya Prabandham, for example Tiruvaymoli. The Vedas are among the oldest sacred texts. The Samhitas date to roughly 1700–1100 BC, and the "circum-Vedic" texts, as well as the redaction of the Samhitas, date to c. 1000-500 BC, resulting in a Vedic period, spanning the mid 2nd to mid 1st millennium BC, or the Late Bronze Age and the Iron Age. The Vedic period reaches its peak only after the composition of the mantra texts, with the establishment of the various shakhas all over Northern India which annotated the mantra samhitas with Brahmana discussions of their meaning, and reaches its end in the age of Buddha and Panini and the rise of the Mahajanapadas (archaeologically, Northern Black Polished Ware). Michael Witzel gives a time span of c. 1500 to c. 500-400 BC. Witzel makes special reference to the Near Eastern Mitanni material of the 14th century BC the only epigraphic record of Indo-Aryan contemporary to the Rigvedic period. He gives 150 BC (Patañjali) as a terminus ante quem for all Vedic Sanskrit literature, and 1200 BC (the early Iron Age) as terminus post quem for the Atharvaveda. Transmission of texts in the Vedic period was by oral tradition, preserved with precision with the help of elaborate mnemonic techniques. A literary tradition is traceable in post-Vedic times, after the rise of Buddhism in the Maurya period,[note 2] perhaps earliest in the Kanva recension of the Yajurveda about the 1st century BC; however oral tradition of transmission remained active. Witzel suggests the possibility of written Vedic texts towards the end of 1st millennium BCE. Some scholars such as Jack Goody state that "the Vedas are not the product of an oral society", basing this view by comparing inconsistencies in the transmitted versions of literature from various oral societies such as the Greek, Serbia and other cultures, then noting that the Vedic literature is too consistent and vast to have been composed and transmitted orally across generations, without being written down. However, adds Goody, the Vedic texts likely involved both a written and oral tradition, calling it a "parallel products of a literate society". The Samhitas (Sanskrit saṃhitā, "collection"), are collections of metric texts ("mantras"). 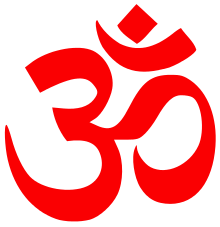 There are four "Vedic" Samhitas: the Rig-Veda, Sama-Veda, Yajur-Veda, and Atharva-Veda, most of which are available in several recensions (śākhā). In some contexts, the term Veda is used to refer to these Samhitas. This is the oldest layer of Vedic texts, apart from the Rigvedic hymns, which were probably essentially complete by 1200 BC, dating to c. the 12th to 10th centuries BC. The complete corpus of Vedic mantras as collected in Bloomfield's Vedic Concordance (1907) consists of some 89,000 padas (metrical feet), of which 72,000 occur in the four Samhitas. The Aranyakas, "wilderness texts" or "forest treaties", were composed by people who meditated in the woods as recluses and are the third part of the Vedas. The texts contain discussions and interpretations of ceremonies, from ritualisitic to symbolic meta-ritualistic points of view. It is frequently read in secondary literature. Prodigous energy was expended by ancient Indian culture in ensuring that these texts were transmitted from generation to generation with inordinate fidelity. For example, memorization of the sacred Vedas included up to eleven forms of recitation of the same text. The texts were subsequently "proof-read" by comparing the different recited versions. Forms of recitation included the jaṭā-pāṭha (literally "mesh recitation") in which every two adjacent words in the text were first recited in their original order, then repeated in the reverse order, and finally repeated again in the original order. That these methods have been effective, is testified to by the preservation of the most ancient Indian religious text, the Rigveda, as redacted into a single text during the Brahmana period, without any variant readings within that school. Of these, the first three were the principal original division, also called "trayī vidyā", that is, "the triple science" of reciting hymns (Rigveda), performing sacrifices (Yajurveda), and chanting songs (Samaveda). The Rigveda is the oldest work, which Witzel states are probably from the period of 1900 to 1100 BC. Witzel, also notes that it is the Vedic period itself, where incipient lists divide the Vedic texts into three (trayī) or four branches: Rig, Yajur, Sama and Atharva. Each Veda has been subclassified into four major text types – the Samhitas (mantras and benedictions), the Aranyakas (text on rituals, ceremonies such as newborn baby's rites of passage, coming of age, marriages, retirement and cremation, sacrifices and symbolic-sacrifices), the Brahmanas (commentaries on rituals, ceremonies and sacrifices), and the Upanishads (text discussing meditation, philosophy and spiritual knowledge). The Upasanas (short ritual worship-related sections) are considered by some scholars as the fifth part. Witzel notes that the rituals, rites and ceremonies described in these ancient texts reconstruct to a large degree the Indo-European marriage rituals observed in a region spanning the Indian subcontinent, Persia and the European area, and some greater details are found in the Vedic era texts such as the Grhya Sūtras. The books were composed by poets from different priestly groups over a period of several centuries from roughly the second half of the 2nd millennium BC (the early Vedic period), starting with the Punjab (Sapta Sindhu) region of the northwest Indian subcontinent. The Rigveda is structured based on clear principles – the Veda begins with a small book addressed to Agni, Indra and other gods, all arranged according to decreasing total number of hymns in each deity collection; for each deity series the hymns progress from longer to shorter ones; yet, the number of hymns per book increases; finally, the meter too is systematically arranged from jagati and tristubh to anustubh and gayatri as the text progresses. In terms of substance, the nature of hymns shift from praise of deities in early books to Nasadiya Sukta with questions such as, "what is the origin of the universe?, do even gods know the answer? ", the virtue of Dāna (charity) in society, and other metaphysical issues in its hymns. The Samaveda Samhita consists of 1549 stanzas, taken almost entirely (except for 75 mantras) from the Rigveda. The Samaveda samhita has two major parts. The first part includes four melody collections (gāna, गान) and the second part three verse “books” (ārcika, आर्चिक). A melody in the song books corresponds to a verse in the arcika books. Just as in the Rigveda, the early sections of Samaveda typically begin with hymns to Agni and Indra, but shift to the abstract. Their meters shift also in a descending order. The songs in the later sections of the Samaveda have the least deviation from the hymns derived from the Rigveda. In the Samaveda, some of the Rigvedic verses are repeated more than once. Including repetitions, there are a total of 1875 verses numbered in the Samaveda recension translated by Griffith. Two major recensions have survived, the Kauthuma/Ranayaniya and the Jaiminiya. Its purpose was liturgical, and they were the repertoire of the udgātṛ or "singer" priests. The Artharvaveda Samhita is the text 'belonging to the Atharvan and Angirasa poets. It has about 760 hymns, and about 160 of the hymns are in common with the Rigveda. Most of the verses are metrical, but some sections are in prose. Two different versions of the text – the Paippalāda and the Śaunakīya – have survived into the modern times. The Atharvaveda was not considered as a Veda in the Vedic era, and was accepted as a Veda in late 1st millennium BC. It was compiled last, probably around 900 BC, although some of its material may go back to the time of the Rigveda, or earlier. The Atharvaveda is sometimes called the "Veda of magical formulas", an epithet declared to be incorrect by other scholars. The Samhita layer of the text likely represents a developing 2nd millennium BC tradition of magico-religious rites to address superstitious anxiety, spells to remove maladies believed to be caused by demons, and herbs- and nature-derived potions as medicine. The text, states Kenneth Zysk, is one of oldest surviving record of the evolutionary practices in religious medicine and reveals the "earliest forms of folk healing of Indo-European antiquity". Many books of the Atharvaveda Samhita are dedicated to rituals without magic, such as to philosophical speculations and to theosophy. The substance of the Brahmana text varies with each Veda. For example, the first chapter of the Chandogya Brahmana, one of the oldest Brahmanas, includes eight ritual suktas (hymns) for the ceremony of marriage and rituals at the birth of a child. The first hymn is a recitation that accompanies offering a Yajna oblation to Agni (fire) on the occasion of a marriage, and the hymn prays for prosperity of the couple getting married. The second hymn wishes for their long life, kind relatives, and a numerous progeny. The third hymn is a mutual marriage pledge, between the bride and groom, by which the two bind themselves to each other. The sixth through last hymn of the first chapter in Chandogya Brahmana are ritual celebrations on the birth of a child, and wishes for health, wealth and prosperity with a profusion of cows and artha. However, these verses are incomplete expositions, and their complete context emerges only with the Samhita layer of text. Architecture (Sthapatyaveda), associated with the Yajurveda. Medicine (Āyurveda), associated with the Atharvaveda . ↑ The early Buddhist texts are also generally believed to be of oral tradition, with the first Pali Canon written many centuries after the death of the Buddha. ↑ see e.g. Pokorny's 1959 Indogermanisches etymologisches Wörterbuch s.v. u̯(e)id-²; Rix' Lexikon der indogermanischen Verben, u̯ei̯d-. ↑ Lucas F. Johnston, Whitney Bauman (2014). Science and Religion: One Planet, Many Possibilities. Routledge. p. 179. 1 2 Donald S. Lopez Jr. (1995). "Authority and Orality in the Mahāyāna". Numen. Brill Academic. 42 (1): 21–47. JSTOR 3270278. ↑ Witzel, Michael, "Vedas and Upaniṣads", in: Flood 2003, p. 69; For oral composition and oral transmission for "many hundreds of years" before being written down, see: Avari 2007, p. 76. ↑ Jamison, Stephanie W.; Brereton, Joel P. (2014). The Rigveda. vol. 1. Oxford University Press. p. 18. ISBN 978-0-19-972078-1. ↑ "Cultural Heritage of Nepal". Nepal-German Manuscript Preservation Project. University of Hamburg. Retrieved 4 November 2014. ↑ Buswell, Robert E.; Lopez, Jr., Donald S. (2013). The Princeton dictionary of Buddhism. Princeton: Princeton University Press. ISBN 9781400848058. Entry on "Nālandā". ↑ Frazier, Jessica, ed. (2011). The Continuum companion to Hindu studies. London: Continuum. p. 34. ISBN 978-0-8264-9966-0. ↑ Walton, Linda (2015). "Educational institutions" in The Cambridge World History Vol. 5. Cambridge: Cambridge University Press. p. 122. ISBN 978-0-521-19074-9. ↑ according to ISKCON, Hindu Sacred Texts, "Hindus themselves often use the term to describe anything connected to the Vedas and their corollaries (e.g. Vedic culture)". 1 2 3 4 Michaels 2004, p. 51. 1 2 Witzel, Michael, "Vedas and Upaniṣads", in: Flood 2003, p. 69. ↑ For a table of all Vedic texts see Witzel, Michael, "Vedas and Upaniṣads", in: Flood 2003, pp. 100–101. ↑ The Vedic Sanskrit corpus is incorporated in A Vedic Word Concordance (Vaidika-Padānukrama-Koṣa) prepared from 1930 under Vishva Bandhu, and published in five volumes in 1935-1965. Its scope extends to about 400 texts, including the entire Vedic Sanskrit corpus besides some "sub-Vedic" texts. Volume I: Samhitas, Volume II: Brahmanas and Aranyakas, Volume III: Upanishads, Volume IV: Vedangas; A revised edition, extending to about 1800 pages, was published in 1973-1976. ↑ Edward Roer (Translator), Shankara's Introduction at Google Books to Brihad Aranyaka Upanishad at pages 1-5; Quote - "The Vedas are divided in two parts, the first is the karma-kanda, the ceremonial part, also (called) purva-kanda, and treats on ceremonies; the second part is the jnana kanda, the part which contains knowledge, also named uttara-kanda or posterior part, and unfolds the knowledge of Brahma or the universal soul." 1 2 3 4 Wendy Doniger (1990), Textual Sources for the Study of Hinduism, 1st Edition, University of Chicago Press, ISBN 978-0226618470, pages 2-3; Quote: "The Upanishads supply the basis of later Hindu philosophy; they alone of the Vedic corpus are widely known and quoted by most well-educated Hindus, and their central ideas have also become a part of the spiritual arsenal of rank-and-file Hindus." ↑ Patrick Olivelle (2014), The Early Upanisads, Oxford University Press, ISBN 978-0195352429, page 3; Quote: "Even though theoretically the whole of vedic corpus is accepted as revealed truth [shruti], in reality it is the Upanishads that have continued to influence the life and thought of the various religious traditions that we have come to call Hindu. Upanishads are the scriptures par excellence of Hinduism". 1 2 Flood 1996, p. 39. ↑ Michael Witzel, "Vedas and Upaniṣads", in: Flood 2003, p. 69, Quote: "... almost all printed editions depend on the late manuscripts that are hardly older than 500 years"
↑ see e.g. Avari 2007, p. 77. ↑ For 1,028 hymns and 10,600 verses and division into ten mandalas, see: Avari 2007, p. 77. ↑ For characterization of content and mentions of deities including Agni, Indra, Varuna, Soma, Surya, etc. see: Avari 2007, p. 77. ↑ see e.g. Avari 2007, p. 77 Max Müller gave 1700–1100 BC, Michael Witzel gives 1450-1350 BC as terminus ad quem. ↑ (from sāman, the term for a melody applied to a metrical hymn or a song of praise, Apte 1965, p. 981. ↑ For 1875 total verses, see the numbering given in Ralph T. H. Griffith. Griffith's introduction mentions the recension history for his text. Repetitions may be found by consulting the cross-index in Griffith pp. 491-99. 1 2 3 4 Michaels 2004, p. 56. ↑ "The latest of the four Vedas, the Atharva-Veda, is, as we have seen, largely composed of magical texts and charms, but here and there we find cosmological hymns which anticipate the Upanishads, -- hymns to Skambha, the 'Support', who is seen as the first principle which is both the material and efficient cause of the universe, to Prāna, the 'Breath of Life', to Vāc, the 'Word', and so on." Zaehner 1966, p. vii. 1 2 Jan Gonda (1975), Vedic Literature: Saṃhitās and Brāhmaṇas, Vol 1, Fasc. 1, Otto Harrassowitz Verlag, ISBN 978-3447016032, pages 277-280, Quote: "It would be incorrect to describe the Atharvaveda Samhita as a collection of magical formulas". ↑ Mahadevan 1956, p. 59. ↑ Annette Wilke & Oliver Moebus 2011, pp. 391-394 with footnotes, 416-419. ↑ Harold G. Coward 1990, pp. 105-110. ↑ Monier-Williams 2006, p. 207. Accessed 5 April 2007. ↑ Apte 1965, p. 293. ↑ "Upaveda". Oxford University Press. Retrieved 7 December 2014. ↑ Frawley, David; Ranade, Subhash (2001). Ayurveda, Nature's Medicine. Lotus Press. p. 11. Retrieved 6 January 2015. ↑ Coormaraswamy and Duggirala (1917). "The Mirror of Gesture". Harvard University Press. pp. 2–4. ↑ "Rig Veda in UNESCO Memory of the World Register". Holdrege, Barbara A. (1995). Veda and Torah. SUNY Press. ISBN 0-7914-1639-9. J. Gonda, Vedic Literature: Saṃhitās and Brāhmaṇas, A History of Indian literature. Vol. 1, Veda and Upanishads (1975), ISBN 978-3-447-01603-2. J. A. Santucci, An Outline of Vedic Literature (1976). S. Shrava, A Comprehensive History of Vedic Literature — Brahmana and Aranyaka Works, Pranava Prakashan (1977). Vishva Bandhu, Bhim Dev, S. Bhaskaran Nair (eds. ), Vaidika-Padānukrama-Koṣa: A Vedic Word-Concordance, Vishveshvaranand Vedic Research Institute, Hoshiarpur, 1963–1965, revised edition 1973-1976. Griffiths, Arlo and Houben, Jan E. M. (eds. ), The Vedas : texts, language & ritual: proceedings of the Third International Vedic Workshop, Leiden 2002, Groningen Oriental Studies 20, Groningen : Forsten, (2004), ISBN 90-6980-149-3.